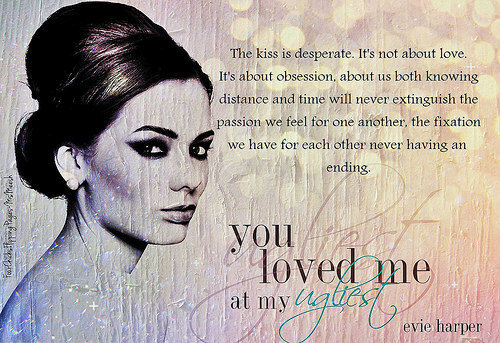 When I first read You Loved Me At My Darkest by Evie Harper, I was taken on one of hell of an emotional, heartbreaking, and touching journey that was able to grip my heart when it showcased that love can cast away the darkest moments in our life. And in You Loved Me At My Weakest, Evie once again takes her readers on one gripping, poignant, profound and touching journey of salvation and healing. In true raw fashion, Ms. Harper was able to capture our hearts with the message that love can heal. And now in her third and final installment, You Loved Me At My Ugliest, we are taken down on a different kind of journey. It is a journey where love is tested at our darkest, weakest, and ugliest. If you are fan of the series like myself then we have witnessed Lily and Jake at their darkest, Kanye and Emily at their weakest, and now we will finally see Joseph and Lexi at their ugliest. You Loved Me At My Ugliest was a compelling, poignant, touching, and yet a beautiful journey that showcases the many facets and shades of love. A broken kind of love. A heartbreaking love. A family's love. A love between friends. And a tangible love between two soul mates. In this emotional and raw story of love, Ms. Harper has so eloquently delivered a gripping tale that it's not about the perfect kind of love, but a forever kind of love of accepting our ugliest parts. At a young age, Joseph O' Conner experienced the ugliest kind of life. He knew what it meant to have your life ripped from you from a monster. As a child, we look to our parents to protect us but what happens when your father is the monster who constantly beats you till you have nothing but darkness clouding your soul and heart. Joey knew what it meant to live in a hell. He experienced it everyday from the hands of his father. He breathed and lived the emotional and physical abuse throughout his childhood in order to protect his mother. In his ugliest moment, there was one thing that kept him alive and hoping for a better future and that was Lexi. When he met her, she was his shining light, hope, salvation and true love. She was the woman who loved him from the beginning. So when Lexi and Joey met, their lives and hearts were forever intertwined with one another. It was a tangible bond that could not be destroyed. So what happens when Joey had to leave her behind in order to protect her? Can Lexi forget and move on? Ms. Harper really did take her readers on another gripping and emotional journey. My heart went out to Lexi and Joey because this couple really went through hell and back to get their happily ever after. I loved when an author can make you feel and this book was dripping with the FEELS from hurt, anger, resentment, jealousy, hate, revenge, heartbreak, loss, healing, and love. What I loved about this book was that no one was perfect but through the power of perseverance and love, a broken person can be made whole. It was just a matter finding the right person who is willing to piece back the broken the pieces and heal the ugliest parts. And for Joey, it was Lexi. I really don't want to say much since this book is about experiencing a journey between two soul mates who are given their second chance at love and happily ever after. All I can say is this book will shatter your heart, but slowly Ms. Harper will slowly mend the pieces back. So if you looking for a series that shows love can conquer the darkest, weakest, and ugliest moments in our life, then I highly recommend you to read the You Loved Me Series. I just want to thank Evie Harper for bringing life to her characters: Lily, Jake, Kanye, Emily, Lexi, and Joey. Thank you for that beautiful epilogue and telling their story of love, redemption, salvation, and hope. I look forward to reading Dom and Della's story and of course William's story. Evie- you already caught my attention and has me begging for William's story because there is nothing like reading a broken man who finds love and so his book is definitely my anticipated read of 2016.